A lovely, gentle house with its own beautiful ballroom and impressive modern art. Sleeps up to 22 in 11 bedrooms with 9 bathrooms. Weekends from £2,200 to £4,852, full weeks from £4,568 to £7,064. For shorter stays please enquire. 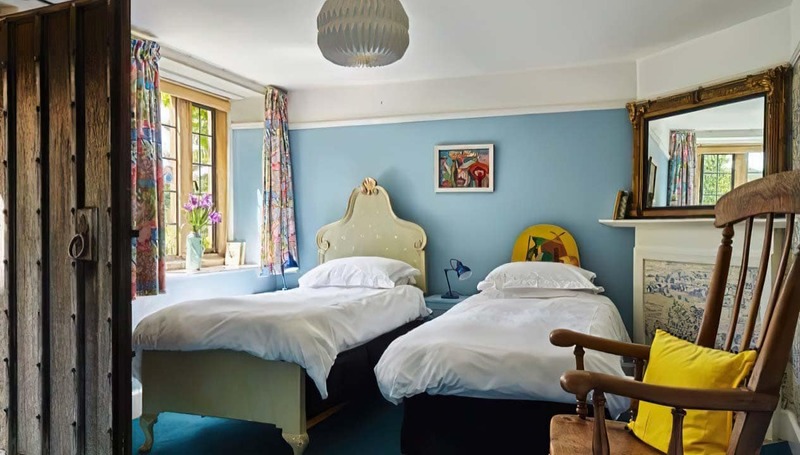 If fully occupied, price per person per night is usually between £30 and £74. A special country-style wedding in a manor house that breathes contentment of the deepest kind. Seats up to 40 indoors and the total venue capacity is 120. 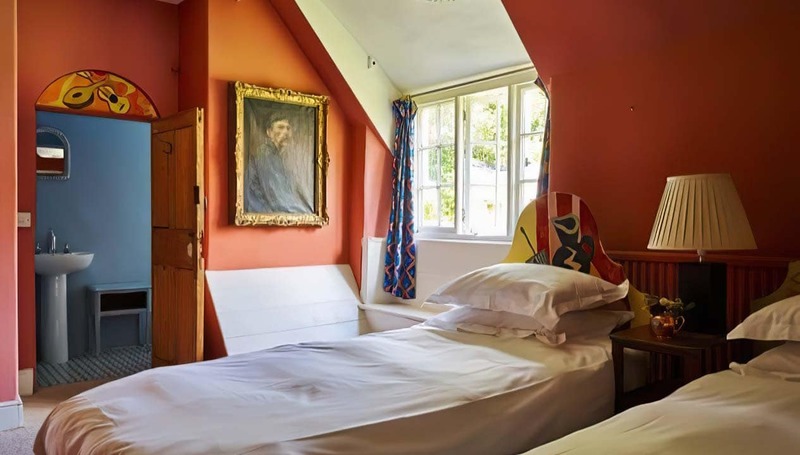 We have welcomed a few famous celebrities who have stayed with us here at Symondsbury Manor including Sir Mick Jagger’s family, Jerry Hall, Boy George, Lee Mack, Count Arthur Strong, Simon Callow, Richard Ayre, Lee Child, Vanessa Kirby, Douglas Booth, Freddie Fox, Daisy Lowe and Jo Brand, just to name a few! Symondsbury Manor is a 17th century country house near Bridport, a mile from the coast of Dorset. It has 11 bedrooms and 9 bathrooms, and sleeps up to 22 guests. The house is the perfect place for a holiday with family or friends, or for special celebrations. Of the eleven bedrooms, one is on the ground-floor, off the kitchen, and is suitable for guests who would prefer not to use too many stairs. 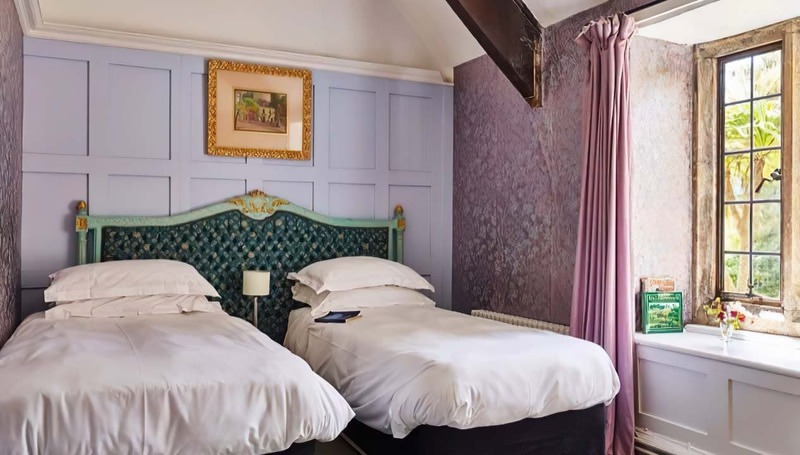 Two of the attic bedrooms are suitable for guests with a young family; the bedrooms are inter-connected and share a large bathroom. 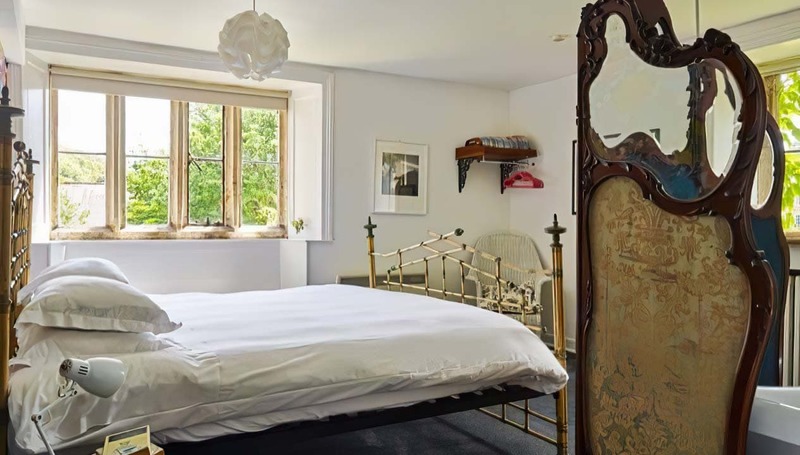 The reception rooms are large and relaxed, and include a sixty-foot long open-plan living room. There is also a huge country-style kitchen, and the sort of massive Aga that inspires immediate Mary Berry fantasies. For any Strictly fantasists, there is a fabulous eighteenth century, panelled ballroom, which can be used for a number of things (not just the cha-cha-cha). It’s a great, flexible space, and has a table-tennis table, excellent for encouraging teenagers off sofas; and a piano, excellent for bringing out repressed aunts. The gardens at Symondsbury are mostly relaxed and informal, and there’s a charming fish pond in which to spot little fish. Symondsbury is within a beautiful, golden village, which is itself a mile from the town of Bridport (famous for the Broadchurch series). The nearest train station is about twelve miles away in Crewkerne, with trains from London. Symondsbury is a mile from West Bay and Dorset’s Jurassic coast, which now holds World Heritage status. The nearby market town of Bridport is famous for its very large Saturday street market of food, antiques and bric-a brac as well as independent shops. In the local area, there are myriad golf courses to choose from, and all manner of water-sports and sea-fishing and diving. If you’d rather stay dry, there are art galleries and evenings of culture in Bridport. Symondsbury Manor was built in the 17th Century, though there may have been a house on the site in earlier times. A ballroom and mullioned windows were added in the eighteenth century. We had a wonderful time, thank you! 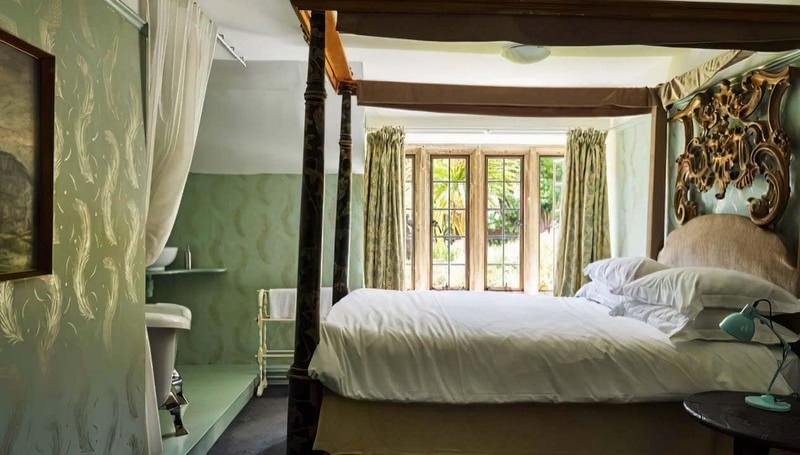 We have stayed at many similar properties of varying sizes over the last few years as part of our annual retreat, but many of our party said that Symondsbury was definitely the favourite. We were all impressed by the friendliness and the welcoming atmosphere. As well as the really interesting inside and gardens, which were great for us photographically. The main living and socialising area was really large, and surprisingly more than adequate for our group. The added bonus of the ballroom meant we could do things like set up light to practice flash photography during a very excitable ping pong game :).I am very sure we will be back with you again in a year or two.